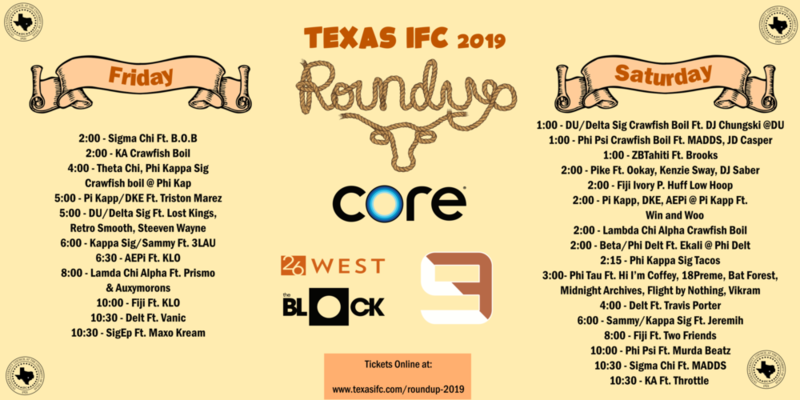 IFC’s 89th annual Roundup is March 29th & 30th! Bellow you can find information about the wristband process, security, events, and philanthropy for this year’s event. To attend any Roundup events you must have an IFC wristband on at all times. Many fraternities will also have their own wristbands for their events. It is mandatory to have their wristbands on for the duration of the event and our IFC wristbands on for the entire weekend. 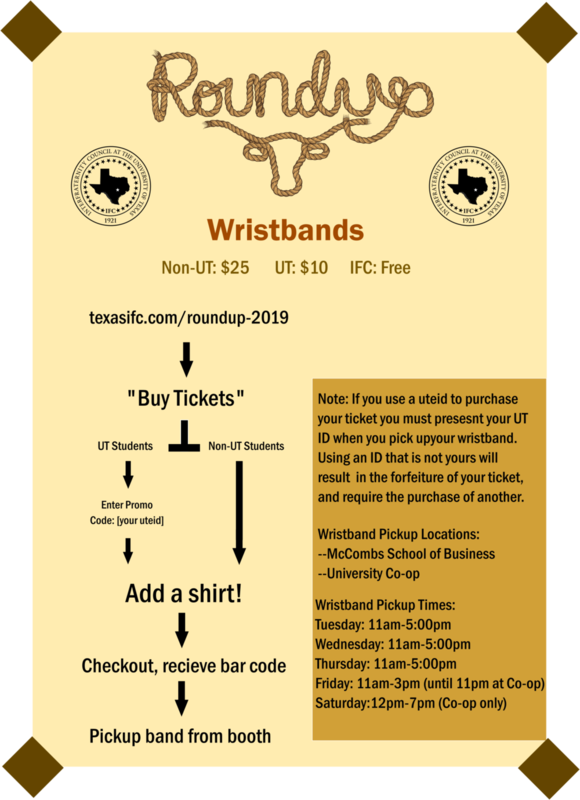 This year all wristbands must be purchased online to be picked up in front of the Co-op or McCombs School of Business at the available times. The link to purchase tickets can be found below. Please purchase your tickets before coming to pick up the wristbands to ensure you will be able to get them. Keep in mind that you MUST present your UT ID if you recieve a discount, and must have a HARD COPY ID to recieve a 21+ band at wristband pickup. If you purchase a Roundup t-shirt it will be available for pickup when you come to get your wristband. American Campus locations listed below will be giving out free bags containing swag, water, and snacks throughout the weekend. Stop by one of their locations to get yours! Your state-issued ID will be checked by a third-party security company when you pickup your wristband. Many fraternities will also have their own security teams to provide 21+ wristbands to their attendees. The Travis County PD provides a Sobering Center in Downtown Austin for anyone that has been over-served and is under the influence. There will be no repercussions for using this service for any visitors or anyone who calls 911 for these individuals. Visitors must be checked out from the sobering center by a friend or relative , they will not be able to use public transportation or ride-sharing services to leave the center. CORE will be providing free water at most events throughout the weekend. Ensure to take advantage of this to stay hydrated throughout the weekend. When purchasing your ticket make sure to provide a suitable emergency contact that will be available throughout the weekend. This contact will be stored in your wristband for first-responders to scan in the event of an emergency. All attendees are required to have a state-issued form of identification on their person while attending any Roundup events, failure to comply could result in further consequences with law enforcement or the university.